August 29, 2017 – NASA researchers say they have passed a major milestone in their quest to mature more powerful tools for directly detecting and analyzing the atmospheres of giant planets outside the solar system — one of the observational goals of NASA’s proposed Wide-Field Infrared Space Telescope, also known as WFIRST. In tests conducted at the High-Contrast Imaging Testbed at NASA’s Jet Propulsion Laboratory, or JPL, in Pasadena, California — one of the world’s most advanced testbeds of its kind — researchers created what they call a region of very deep contrast between a simulated star and its planet. 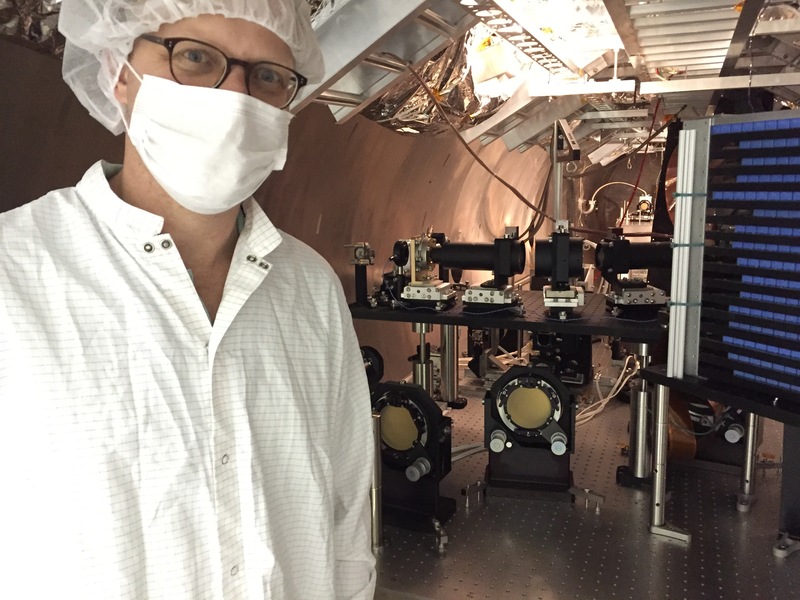 They also demonstrated the ability to detect and analyze the planet’s faint light over a relatively large portion of the visible to near-infrared wavelength band. An instrument developed by scientists at NASA’s Goddard Space Flight Center in Greenbelt, Maryland — the Prototype Imaging Spectrograph for Coronagraphic Exoplanet Studies, or PISCES — played an important role in the demonstration, showing that it could separate light of one or more Jupiter-sized exoplanets by their wavelength (color) and record the data at every position around a star. The light from these planets is exceedingly faint — fainter than their host stars by a factor of 100 million or more, and from our perspective on Earth, these planets appear quite close to their stars. With a conventional imaging camera, the planet’s light is lost in the glare of the star. However, with a coronagraph — a device that suppresses the glare and creates a dark zone around a star — the faint light of an exoplanet can be revealed. “Achieving a contrast this deep over such a broad band has never been done before and was one of our goals. Ideally, we would like to observe the entire spectrum of the planet — in other words, see all its colors at once — but that’s not yet possible with current coronagraphic technologies. Eighteen percent, as demonstrated by PISCES, is the current state of the art,” said Goddard scientist and PISCES Instrument Scientist Michael McElwain. In comparison, JPL’s laboratory coronagraph maintained the same level of dark contrast over 10 percent of the optical-wavelength bands before the commissioning of the table-top PISCES last year. The IFS provides all the wavelength information simultaneously across the entire field of view. With more traditional imaging observations, scientists must cycle through the different wavelengths, which takes time and requires a mechanism to change the filters — requirements not desirable with an orbiting observatory that only has limited time to spend on a target. The optical system itself changes over time due to thermal and dynamic variations, further underscoring the need for simultaneous spectral observations.